The latest comedy from 'Juno' director Jason Reitman and writer Diablo Cody is now coming a month earlier in March. As previously reported, Paramount was working on 'Young Adult' for a high-definition bow on April 24, but now the new date looks to be March 13. Academy Award® winner Charlize Theron stars as Mavis Gary, a 37-year-old former prom queen, and current writer of young adult novels, who returns home to relive her glory days and win back her now-married high school sweetheart. When she finds her homecoming more challenging than expected, Mavis forms an unusual bond with a former classmate and both must face the harsh realities of growing up in this brilliant and bittersweet story critics are hailing as a “one-of-a kind comedy”* and “quirky, funny, heartfelt.”** *Lisa Schwarzbaum, Entertainment Weekly ** Manny, DeLa Rose, NBC TV. The Blu-ray/UV Digital Copy will feature 1080p video, a DTS-HD Master Audio 5.1 soundtrack, and supplements include: Commentary by director Jason Reitman, director of photography Eric Steelberg, and first assistant director/associate producer Jason A. Blumenfeld; Misery Loves Company: The Making of Young Adult; The Awful Truth: Deconstructing a Scene; Q&A featuring critic Janet Maslin and Jason reitman at the Jacob Burns Film Center; and deleted scenes. Suggested list price for the Blu-ray set is $39.99. 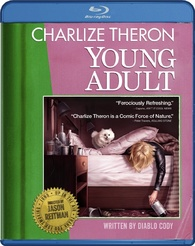 You can find the latest specs for 'Young Adult' linked from our Blu-ray Release Schedule, where it's indexed under March 13.